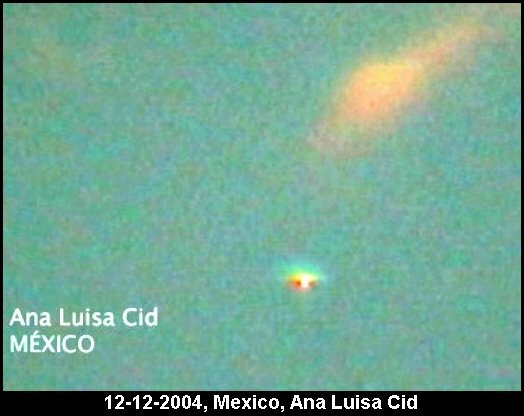 Ufologist and videographer Ana Luisa Cid writes: "Today, December 12 at 8:00 A.M., I noticed a strange light moving in the sky in a south to north direction. Upon making a close-up, I lowered the light intensity somewhat (exposure) in order to appreciate the details with greater clarity." "I saw [the object] for some 5 minutes and it was captured on a Sony 340 camcorder. On this date Mexico celebrates the feast of Our Lady of Guadalupe, so it is common to see balloons aloft and pyrotechnics. However, I do not believe this object corresponds to anything known." Thanks to INEXPLICATA, The Journal of Hispanic Ufology, December 13, 2004. Translation spanish to english © Scott Corrales, Institute of Hispanic Ufology. Photo credit: Ana Luisa Cid. This page was last updated on December 14, 2004.